OFM Multi-Function Posture Task Chair [118-2] - Free Shipping! This task chair from OFM features two levers that control the chairs ergonomic adjustments to help reduce operator fatigue and discomfort throughout the work day. These OFM office chairs also include a height & pitch adjustable back, built-in lumbar support, pneumatic gas lift seat height adjustment, adjustable height "T" style arms, teflon-coated, stain-resistant fabric and a five star base with dual wheel casters. Additional options like soft wheel casters for hardwood floors or fixed glides (keep the chair solidly in place) are available for a minimal charge. This chair meets or exceeds ANSI/BIFMA standards. Dimensions: Seat size: 19"W x 19"D. Back size: 17.5"W x 19"H Seat height adjustment: 18"-22"H. Limited lifetime warranty from OFM. 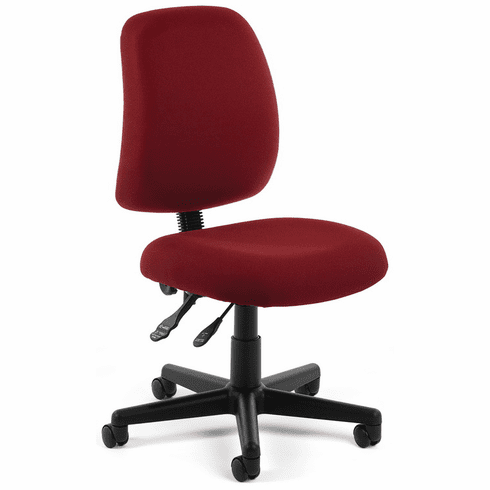 These OFM chairs normally ship within 1-2 business days from our NC or AZ warehouse.